Walker Mobility – Efficient, Reliable and Our #1 Recommendation! We recently visited the Walt Disney World Resort and had some extended family join us for 4 days (Sept 14 – 18). Included in the extended family was my husband’s 91 year old Grandfather. While Grandpa is still young at heart (seriously… he rode all 3 mountains! ), I think it’s fair to say that at 91 years old, he moves more slowly, using a cane or walker to help him get around. We felt it necessary to have him use a scooter (ECV) at the Disney Parks so that he could keep up with us. I began researching Scooter Rental Companies, and even contacted (via internet form) one of the Preferred Providers to Disney. No response – ouch! I then asked fans of the WDW Hints facebook page who they recommend. An overwhelming amount of you highly recommended Walker Mobility! So, I contacted Walker Mobility and got a call back first thing the next morning from John Walker – the CEO himself! He was very informative and shared the history of his family business and was willing to let me come to a decision on my own – no pressure sales. When we did decide that Walker Mobility was the company we’d like to try, I called back and spoke to Crystal. She was very nice, and efficient – as an email confirmation of our scooter rental was already sitting in my inbox shortly after I hung up the phone with her. 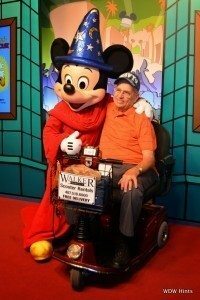 Walker Mobility has FREE delivery to the Disney Resorts. We set up a time frame for them to meet us at Old Key West, and they were there before we were! Julio met us just outside of Bell Services, shook our hands, and gave us a quick tutorial on how to use the scooter and how to trouble shoot problems if something were to not work correctly. Having an actual employee of Walker Mobility there to show us the mechanics of the scooter and answer our questions gave us such peace of mind, but also confidence that we could handle this in the parks. The scooter worked fabulously!! The battery lasted all day long (from 7:30 a.m. to 9:30 p.m. and probably longer, but that’s when we ended our days) – and Grandpa gave it a workout being at the parks from opening until closing. We didn’t experience any problems at all. Grandpa was able to maneuver it through line queues, keep up with us in the parks (sometimes getting ahead of us! ), and was able to enjoy everything that we did! When our vacation came to an end, Jim met us to pick-up the scooter (again, free pick-up). With a quick call, he confirmed that we were at our resort, and we met him outside of Bell Services. The process of working with Walker Mobility was incredibly easy and stress-free! No pressure sales, easy reservation process, and we never had to wait on them – they were there first for drop-off and pick-up. Walker Mobility is definitely our #1 recommendation for Scooter rentals. To top it off, when we arrived back home after our week in Orlando, there was a Thank You card waiting for us in our mailbox from Walker Mobility ~ A nice touch that was certainly appreciated. Thank you Walker Mobility!! Editors Note: We received a free scooter rental from Walker Mobility in exchange for an honest review. Our reviews are not influenced by receiving a free rental, nor are we compensated any other way for reviewing products. 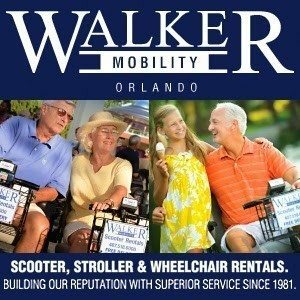 Walker Mobility provides scooter, wheelchair and stroller rentals to guests in and around Orlando, Florida. To reserve a scooter, wheelchair or stroller for your next vacation, call 1-888-SCOOTER or visit Walker Mobility online. Sweet deal. Thanks for the review. Might have to try them out if we need a stroller on a future trip!